I was aware of the positive reviews of this film before going to see it at our local cinema a few weeks after its release. However, I was not prepared for the effect it would have. This is a vivid, powerful and personal depiction of the rescue operation to evacuate the British Expeditionary Force from the Dunkirk beach through three sets of events based on land, sea and air. The film’s authenticity derives from its focus on a few, one could say almost incidental characters. These include two soldiers’ efforts to escape from the beach, the travails of the captain of a small motor boat from Weymouth as part of the flotilla of small vessels sent to rescue the stranded troops, and the pilots of three Spitfires with limited fuel. The director Christopher Nolan interweaves the three stories in a way which demands attention from the viewer. Rather than describe the plot, I would like to try to share my experience of watching the film. From the first scene when a group of British soldiers is caught by hidden snipers leaving one bewildered survivor, the film brings alive the sense of anxiety and suspense that must have been experienced by the servicemen trapped on the beach. As a watcher, one is impelled to share that fear. Two particular scenes where German dive bombers start to attack the beach and later on, the pier leading to the ships, were excruciating to witness. Thousands of men trapped where they stood, hoping that they would not be hit. Survival was purely a matter of chance. Short scenes such as the solitary soldier who despairingly wades into the sea to start swimming away to almost certain death to escape the beach and the soldiers trapped in a fishing boat being used for target practice by the enemy (who does not know they are there – if they leave the boat they will be shot) reinforce the atmosphere of desperation. Set against this is the quiet bravery of the pilots and individuals who rescued others from sinking ships only to lose their own lives. The film does not take sides or make judgements about individuals’ behaviour, but bears witness to what is happening. The acting is naturalistic and convincing throughout, with Mark Rylance a standout as the humane yet determined captain of the motorboat who has to try to rescue one of the Spitfire pilots, and manage a traumatised survivor from a torpedoed ship. The film’s impact is heightened by the avoidance of computer-driven special effects. 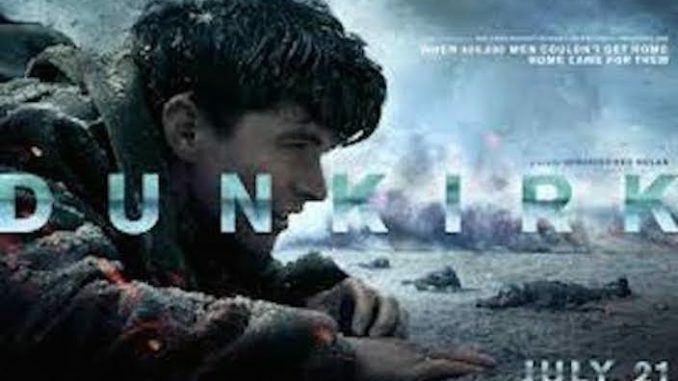 The film was shot on the real Dunkirk beach, with real Spitfire aircraft and original ships from the period. The accompanying music does not “lead” the viewer but reinforces the fear and anxiety felt by the characters in an unobtrusive manner which is below the level of the sound effects. The composer Hans Zimmer makes considerable use of an auditory illusion called a Shepard tone to heighten the sense of unease which was combined with the sound of a ticking clock. A Shepard tone is a sound consisting of a superposition of sine waves separated by octaves. When played with the bass pitch of the tone moving upward or downward, it is referred to as the Shepard scale. This creates the auditory illusion of a tone that continually ascends or descends in pitch, yet which ultimately seems to get no higher or lower. The tempo of the score was deliberately written to be the same as the engine from one of the small boats. During the seminal scene when the mist clears and the despairing soldiers see the flotilla of small boats trying to rescue them, Zimmer uses a slowed down version of Elgar’s Nimrod from the Enigma Variations which is uplifting without being jingoistic. Contrary to what would be expected, this film is not triumphalist in tone. There is a sense of shocked relief that so many of the soldiers returned but this was a humiliation for the British Army, with a huge number (over 130,000) of troops captured. One of the reasons for being so strongly moved by it was my experience of visiting the actual Dunkirk evacuation (Operation Dynamo) command centre in the cliff tunnels below Dover Castle which really brings alive the complex and harrowing task of rescuing 338,000 men over a few days. 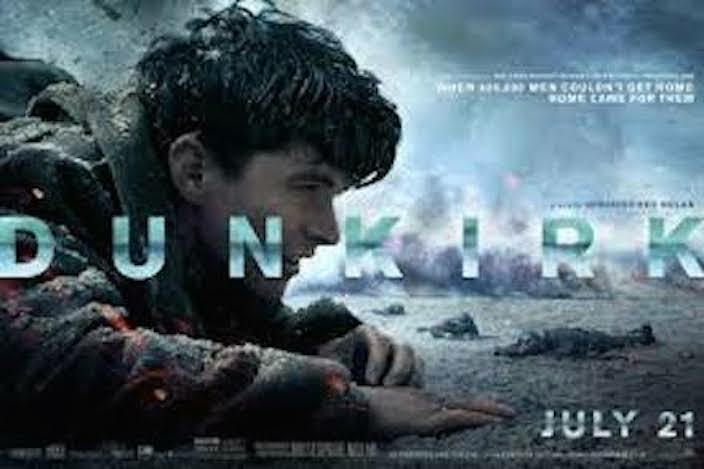 I heard afterwards that one of the parents at our daughter’s school, a serving soldier in the British Army had described Dunkirk as the best war film he’d ever seen. It is certainly one of the best war films I have seen. It truly captures how a historic moment must have been experienced by those involved.